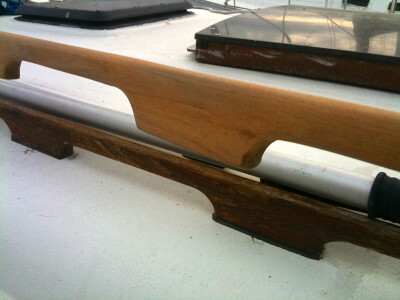 The handrails on my boat have taken a beating over the years from the sun. What was once a rich shiny brown is now a dull faded gray. I had been thinking about sanding the teak handrails down for some time but the thought of the work involved made me delay it far too long. When I finally set myself down to do it, I thought I would do it right. I would remove the hand rails completely and sand the them down, stain it and finally stain it. I was getting a leak in the cabin and I was pretty sure it was coming through the screws holding the hand rail to the deck. The first challenge I had was removing them. I could not find any screws anywhere. The top of the hand rails typically have little wood end caps that cover the screws, but on these it looked as if it was attached from inside the cabin upwards. The cabin ceiling had a solid liner that restriced access to the underside of the deck. This liner is purely cosmetic, and made it really difficult to find the screw heads. After countless hours drilling exploratory holes, I managed to locate every screw that held the handrail to the deck. I will have to find a nice way to cover all the holes I created in the liner. I am thinking a nice straight wood panel stained to match the boat interior. But thats another project that I won’t go into right now. The screws attaching the hand rail at first glance looked like standard philips head screws. Unfortunately after wrestling with them, I found the soft brass screws that had been used, would strip and I had a hell of a time extracting the screw. Quick tip. Do not go to Princess auto and get the cheap screw extractor. I wasted a good weekend trying to remove the soft brass screws. I found a good quality extractor works much better and saved my back from ruin. It turns out Philips heads are designed to allow the screw driver to slip out if too much force is exerted. In my case these old brass screws had rusted themselves firmly into the hand rail and boat deck. The screw heads also were an obscure screw head that look very similar to the philips heads, called the Frearson or Reed & Prince. Reading up on these screw heads, they were used in days of for marine use and have a much steepver “v” shape to them. I found one of my screw head bits in my rachet set fit perfectly and I no longer stripped every screw. I wish I had realized this earlier. Okay wait, wasn’t this whole project supposed to be about sanding and staining the hand rail. Well thats how a lot of these boat projects go. A seemingly simple tasks becomes a monster of a job. 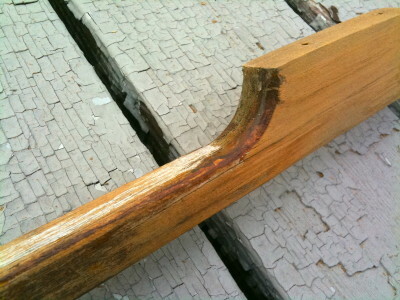 You can see in the partially sanded handrail photo, that areas where the previous stain had flaked out was now a grey color. The problem with letting your woodwork get to this state is it dries out the wood and making prone to splinter. I found that even though sanding it down returned the wood back to a wonderful rich brown, I was finding some areas of the wood were starting to split during the reinstalling phase. I used the only sander I had access to, my massive random orbital sander. It was a bit overkill for this kind of job so I had to resort to sanding by hand for all the tricky curvy parts. You would probably do better with a flat sander or one of those easy to maneuver Fein multi tools although I haven’t had a chance to try them yet. Once the wood was cleaned up, I carefully hung them up inside the cabin. I don’t have access to a nice dust free garage where I could stain with ease so this was the best I could do. I attached a few screws to the hand rail and suspended it with twine. 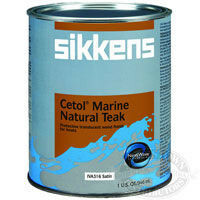 The stain I used was a Cetol Marine Natural Teak stain from Sikkens. Theres a choice of shades and glossy properties to choose from. I think next time I will pick the glossy and see if it is more durable. No matter what shade you pick, they are top quality stains and contain UV inhibitors. I put on 3 coats but if you want the stain to last perhaps another 2 coats would make the layer thicker. Once it has had time to cure, I started preparing the cabin. Every hole that had been exposed is now vulnerable to letting in rain and soaking the precious deck core. What I did was over drill the hole and pick out the core as best as I could. 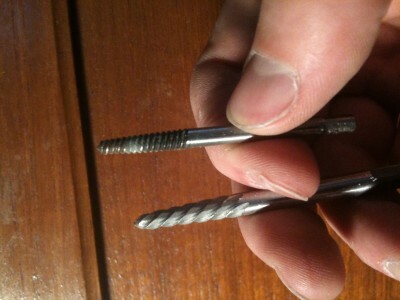 A bent nail chucked into a drill bit is a good trick I read to gouge out the surrounding core. Once you have all the holes clean, tape up the bottom of the hole and seal it. I mixed up a bit of slightly thickened epoxy and injected it into each hole using a syringe. Make sure you work from the bottom of the hole upwards or you will end up leaving air pockets. Let that cure for a day or two and you are ready for re-drilling the new holes. The new holes will now be surrounded by solid epoxy isolating the surrounding deck core. This may seem like a lot of work for no reason, but let me tell you this is worth the extra effort. 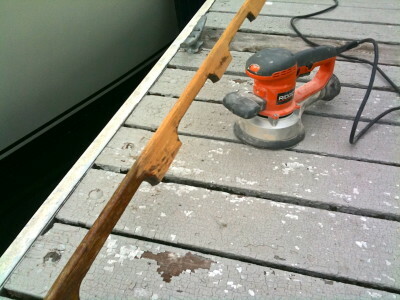 Its cheaper to do this right now, then to replace the entire soggy core of your boat and repaint it. The final step is to fasten it back to the deck. I recommend butyl as a sealant. It really is great stuff. It is easy to manipulate with your hands, and stays soft and maleable forever. Unlike silicone, life seal or the 3M sealants it is a lot cleaner and easier to work with. Its best practice to bevel each hole on the cabin top with a router bit to allow the butyl caulk to wedge in there and keep a good watertight seal. There you have it. 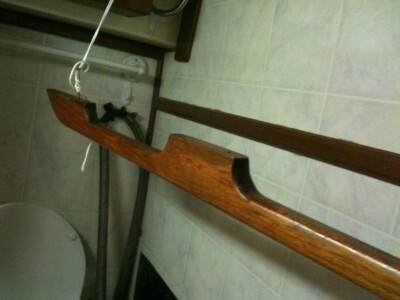 A long process to rebed the teak hand rails. Next season I won’t need to go to the trouble of removing the handrail and instead tape up the surrounding area and stain the handrail in place. Keeping a fresh layer every season (or even end of season) should keep the hand rail looking new for years to come.